Go Grippers Grip, Launch & Roll Train is rated 4.5 out of 5 by 37. Get a Grip on Playtime.™ It’s time to crank up the fun with the Go Grippers Grip, Launch & Roll Train™ from Oball™! With toddlers igniting the fun, there’s no need for batteries! Designed to be your toddler’s first train set, the easy-to-grasp signature Oball™ material makes the train cars easy for little fingers to pick up and play! The interactive train track allows your toddler to reconfigure the track in numerous ways to encourage creativity. Open and close the drawbridge for two levels of play. Don’t forget to make a stop at the crane! The crane rotates and moves to lift the train or other Go Grippers vehicles. Train set works with other Go Grippers™ vehicles (sold separately). Recommended for age 1-1/2 years and up. Dimension (in) 37.7" x 54.8" x 8.4"
Rated 5 out of 5 by DShenk from Kids Love this Track Set My 2 year old daughter plays with this track set all the time. The pieces are strong - for some reason she loves to stand on it! She's really into trains and cars and this track set works great and is very durable. A huge hit in our house! Rated 5 out of 5 by Kimberly624 from Best track ever!! We love to Grip, Launch and Roll train! It was beyond easy to put together and given both my 3.5 year old and almost 1 year old so many hours of play! The assembly of toys is what gets me, as a mom. But fortunately the assembly for this toy took no time and is so much fun!! Rated 5 out of 5 by Runion from Love these little cars!!! I have two boys age 20 months and 3 years old. They absolutely love this set! These cars go on long trips. The set is bright and colorful! It was easy to assemble, which is a win for me because I hate following directions! The 20 month old is able to grasp the cars with his tiny fingers! This set is bigger and takes up room, but the bigger the better in our house hold! Rated 5 out of 5 by NurseMomma from This thing is AWESOME! I Love, love love love, this track, and more importantly so do the kids. Let me start by saying it is BIG, so that might not be for everyone, but in this house, bigger is better. It was a breeze to put together, and there were no stickers that I had to get on straight, so big WIN for this mom. 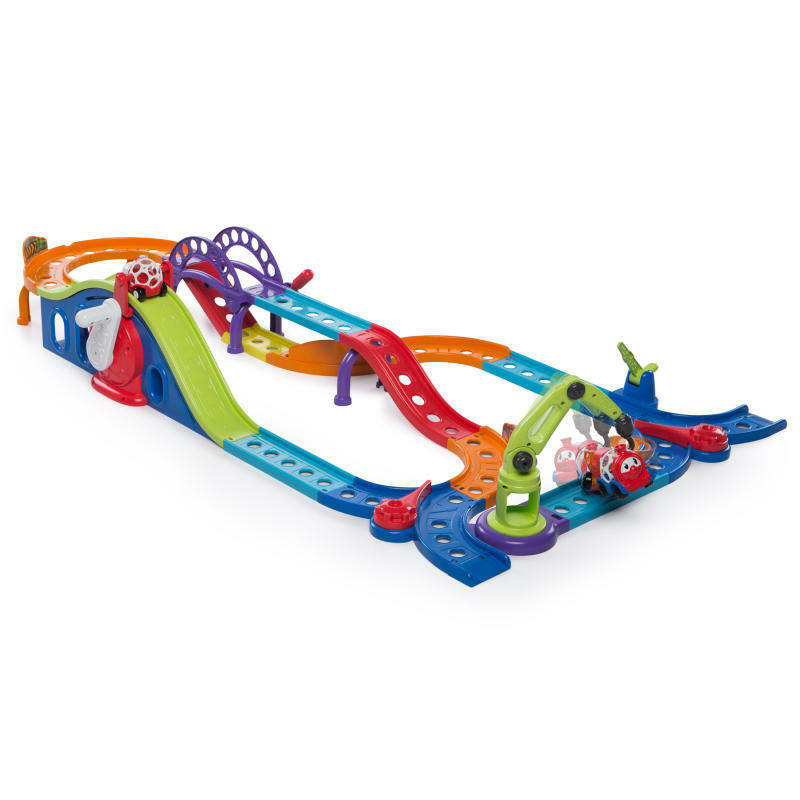 The track snaps together easily, but is secure enough to not fall apart if it is moved around, so nice with you have little hands that get really frustrated when that sort of thing happens. But also easy to deconstruct to change or put away. No batteries, parenting win. Large track so kids are constantly running over each other, parenting win. Multiple "fun" sections, KID win! The only negative that I have seen is the release for the drop bridge is SUPER touchy, it would be nice if it was a bit more secure, but in the grand scheme of things, no one really cares but me, and it isn't my toy to play with. We cannot wait to get additions to this track to make it even bigger! Picture shown has my foot to show you a comparison, I am a size 9 womans. This is an awesome toy for any kid, especially when you've got more than one and they want to be playing on the same toy (and fighting about it) ALL THE TIME! Go out and get it! Rated 4 out of 5 by SDayal from This is awesome! This is awesome! says my 4yo who thoroughly enjoyed assembling the tracks and train. He was able to do it 90% of it. My 12 month old is loving the colors and the different feels. Its fun to do the ups and downs with the car with her. The box is really great so get you from the beginning. The 4YO wanted more cars to play with so we'll be looking for those in store.